When I met my husband the spark that attracted me to him wasn’t words that he spoke. It wasn’t flowers at my doorstep, or holding my hand after dinner. He didn’t do the things we’re told as little girls our “prince charming” will do. In fact while I was confused and hurt many times then, I realize now he just didn’t know what it was I was waiting for. I don’t know if there could have been a wider gulf of what the expectations we had for each other were. Marrying someone from another culture, religion, and lifestyle is an uphill battle. If you choose this path, I’m willing to bet it will be one of the hardest things you will ever do in your life. It’s not supposed to work. Everyone will tell you it won’t work. You WILL insist they are all wrong. Sometimes they will be wrong, and sometimes they will be right. You will need to develop the mental and physical toughness to know when to admit you were wrong and when you need to stand up and fight for it when it’s right. Why here? Why Istanbul? Something called me here long before we landed. The same song that called me to Morocco what is now two decades ago. 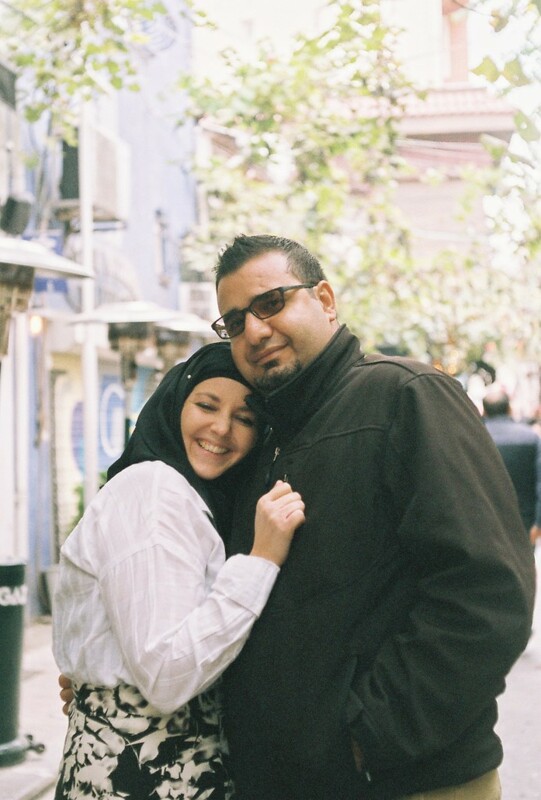 I asked my friend Katie who lives in Istanbul and is a wonderful photographer if she would consider doing a photo shoot with us. We never had proper engagement or wedding photographs and I regret this. When we met the day of the pictures she also brought her friend Martina, another uber-talented photographer along to join us. that something dawned on me. This image so completely captures us. In an insanely accurate way. Here we are standing “on top of” the world. With the city at our feet. Defiant. In love more today than ever. The city below us is one of connections. It’s a mixture of east and west. It’s a blending and mixing of cultures and traditions. It has it’s daily strains but it’s sewn together with languages, food, and stories. 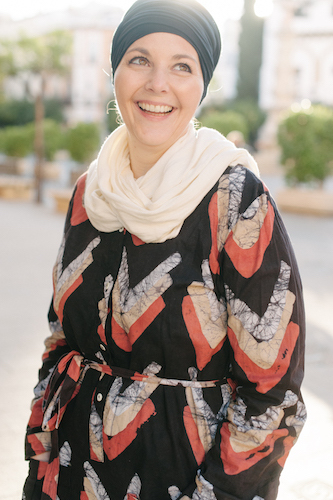 Follow Katie on Instagram and contact her via her website to book your photo session when you’re in Istanbul. Follow Martina on Instagram and check out her work via her website. I’m glad the two of you stuck it out despite the odds. You have some beautiful boys to show for your persistence! 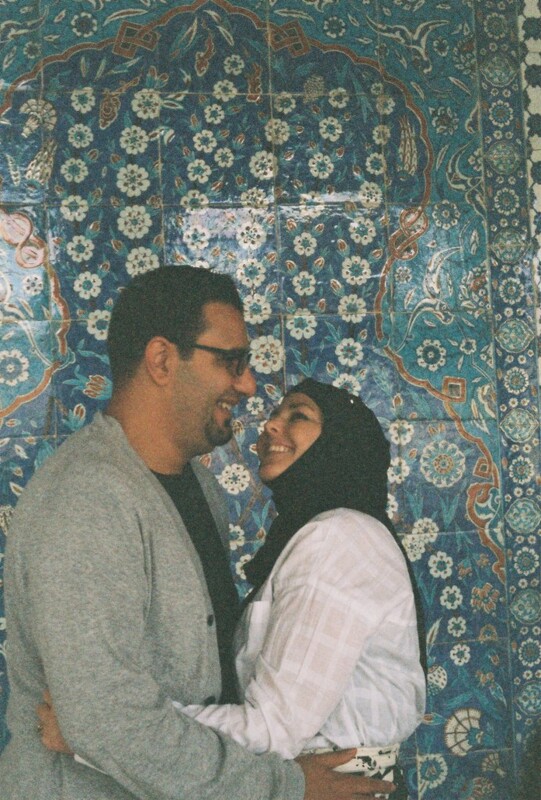 Meshallah, I think these are better than marriage pictures…. They capture the real you’s much better! Funny you say you did not have any proper engagement or marriage photo’s. I did not even have a proper marriage party! Our marriage in Holland was administrational, with only my direct family and two good friends of my husband. And my husband does not like all the fuss about Algerian weddings (maybe that’s why he chose to marry a foreigner?? ), and I agree with him. So we just never talked about it, and the family in Algeria never asked (not to my knowledge anyway). Problem solved…..! But making a photoshoot is a very nice idea. I will keep it in mind insha’Allah. May Allah bless your marriage and your offspring and help us overcome our struggles with dealing with each others cultures. Wow, beautiful in so many ways. Amazing! Macha Allah! So lovely to see happy and strong, committed and successful couples. Hope.